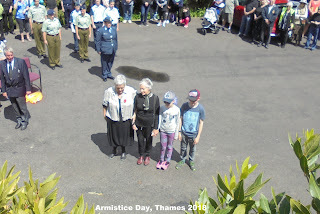 Thames’ World War One Memorial Forest was officially opened and planted 11 August 2015. 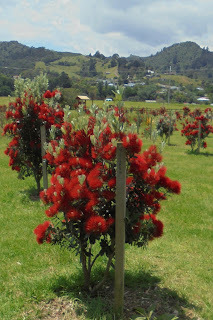 Money ran out and the TCDC was unable to complete all of the forests, the 'canned' forests included the Messines Forest that was to be planted on the Waiotahi spur, Thames. Thankfully the forest that commemorates the known Thames ROH in WWI, was planted and continues to flourish! There have been lost trees, but plans implemented to do replanting and further work is planned for the following year. 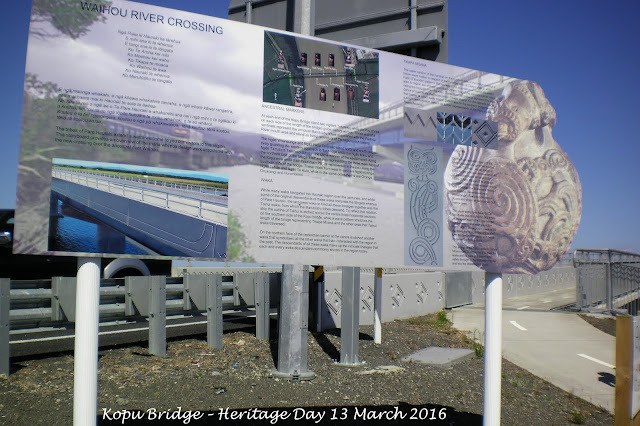 The pohutakawa are a picture, and look even more spectacular as one drives along the Ngati Maru Highway to the Kauaeranga Bridge. There were doubters who wondered how the trees would survive and yes some have been lost to flooding (resulting in the moving of some/replanting). 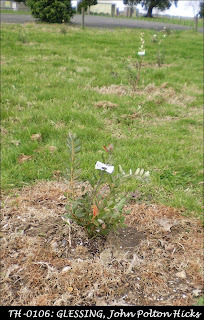 To show how the trees have grown, see the example for the tree planted to commemorate John Polton Hicks GLESSING who was Killed in Action 4 June 1917. If you have a chance, stop and walk amongst the trees, and if you need help identifying a tree/soldier sing out or contact TCDC. In years past it was the norm to place foundation and opening day 'stones' when new public buildings were constructed. Something that seems to go unmarked with many new buildings in Thames today. That being said, there are many that are in a sad state, so it was pleasing to see the Thames Hospital get in behind a project to restore and rehang several important plaques. 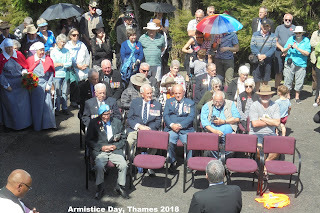 When I researched Thames Memorial and Plaques two years ago, the foundation stone details for the Thames Hospital Nurses' Home (that was opened in 1954) were barely readable. Thames Hospital underwent many changes from the time it was founded as the Thames Goldfields Hospital in 1868. The need for hospital beds and subsequent nursing staff continued to grow. 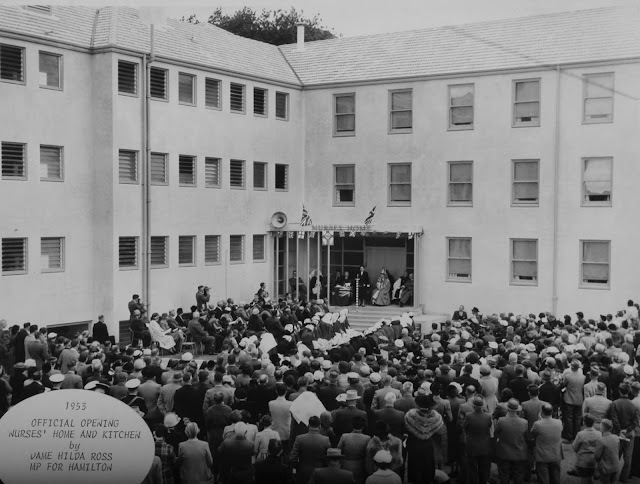 New campus buildings from the 1950s included a new Nurses’ Home at the corner of Mary and Rolleston Streets, Thames. It was mandatory that student nurses live in during the majority of their training; hence the need for a new hostel became imperative. The foundation stone is on the right hand side of the steps. It reads: “This Stone was laid by the Hon. J R Marshall Minister of Health on the 1st May 1952 Lewis Walker ANZIA Architect The Carrington Building Co Ltd Builders.” On the left hand side of the front steps is a plaque that gives details of the Thames Hospital Board in 1952. It reads: “Thames Hospital Board W C Kennedy Chairman J W Neate (?) Deputy Chairman. Members of the Board 1952 T A Barrett, J W Danby, ?” The remainder of the names are unable to be read due to deterioration of the plaque. Thames Star, 11 October 1954. A Barker Collection. Thanks to the efforts of the local stone mason and hospital staff, the plaques at the base of the stairs to the past 'New' Nurses' Home now Manaaki Centre, have been restored and all information can be clearly read. 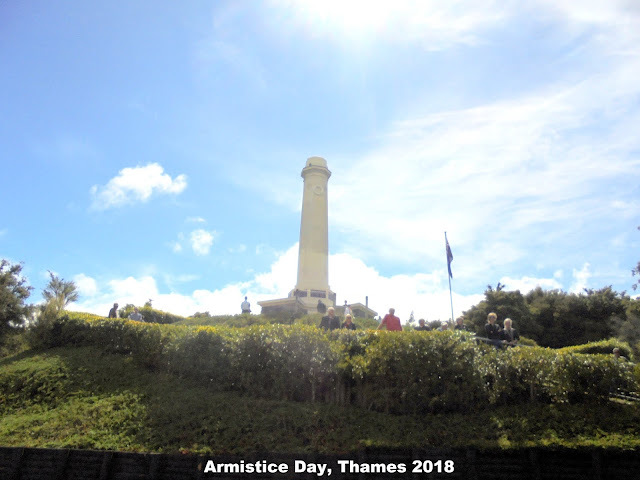 Another excellent project completed as part of the Thames Hospital 150 Commemorations. 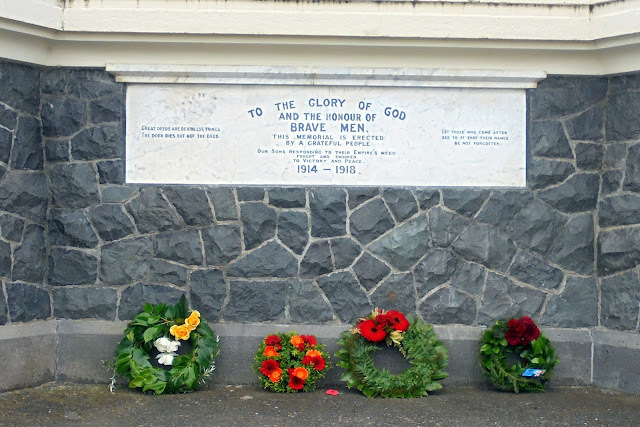 The Plaque on the north side of the Manaaki Centre, has the names of the Thames Hospital Board Members in 1952. This is the Foundation stone that was laid 1 May 1952. The view from the carpark in front of the Manaaki Centre, showing the location of the Foundation Stones. So if you see some plaques that are deteriorating, see what you can do to ensure the history of the building continues. 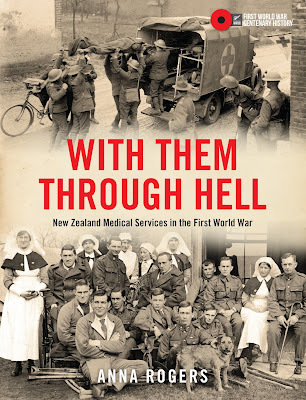 The Sir George Grey Collection at Auckland Libraries never fails to come up trumps with some new material to be discovered. I hadn't spotted these ones relating to our local train builders. 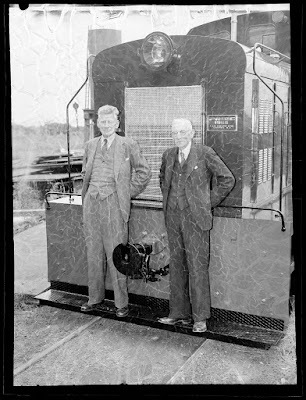 These photographs concerned a contract that the foundry had from 1956 to 1958, whereby they produced ten 15-ton 107hp diesel-mechanical shunting locomotives for New Zealand Rail. They were classed as shunting tractors and given the classification "Tr". Class 'Tr' diesel shunter number 100, the first of 10 of this type built by A and G Price in Thames for New Zealand Railways, on the occasion of the handover at Thames to New Zealand Railways. 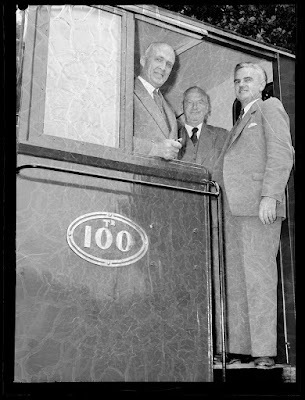 Showing the Minister of Railways, Hon J K McAlpine (left), and the General Manager of New Zealand Railways, A T Gandell (right). The details of the ten shunting locomotives were: (makers no, date in service, NZR old no, NZR TMS No.). The wheel arrangement was 0 - 4 - 0. 169, 12/1956, 100,314; 170, 12/1956, 101, 321; 171, 12/1956, 102, 338; 172, 1/1957, 103, 344; 173, 2/1957, 104, 350; 174, 4/1957, 105, 367; 175, 5/1957, 106, 373; 176, 5/1957, 107, 396; 177, 7/1957, 108, 407; 178, 5/1957, 109, 413. Where are they now? An excellent site provides information on where old NZR stock is located. Tr 103 / 344 From 1957 - 1991 NZR Service, 1991 - 2000 Balance Fertliser, Morrinsville (IS), 2000 - 2009 Balance Fertliser, Morrinsville (ST), 12/2009 Rotorua Ngongotaha Railway Trust (On Loan) - In Service. Tr 104 / 350 In Service with the Kingston Flyer. Tr 107 / 396 In Service. 1957 - 2005 NZR Service, 2005 - 2007 Shantytown (IS), 2007 - 2008 Shantytown (OH), Ways & Works, Middleton (WW 4733). 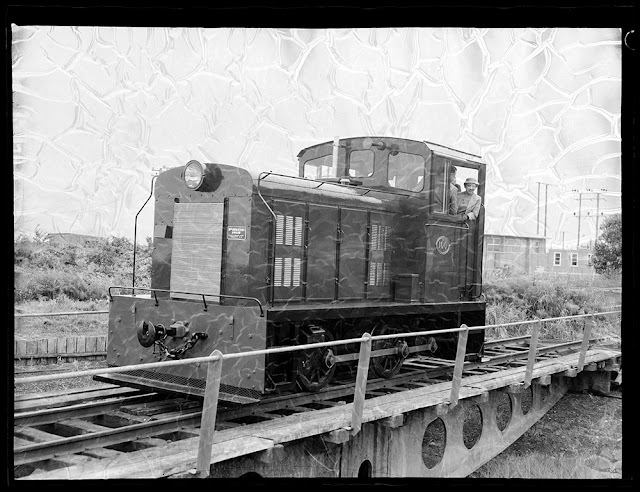 Tr 108 / 407 Ways & Works, Otaki (WW 4346). Waitara Railway Preservation Society. WATCH Tr 407 in action. The long established NZ engineering firm A & G Price of Thames supplied a total of 39 TRs, making them the largest single builder. Four different models were supplied: the Model 3 (TR 100-109), with Gardner 6LW engine and Self Changing Gears 4-speed gearbox; the Model 9 (TR 110-118), powered by a Gardner 6LW engine and Twin Disc torque converter; the Model 4 (TR 157-161), McLaren M6 engine and SCG 4-speed gearbox; and the Model 6 (TR 162-176), engine Gardner 6L3, also SCG 4-speed gearbox. The McLaren engined TRs were re-powered from 1975 with Gardner 6LX engines and the gearbox was replaced with a Twin Disc torque converter. A couple of years back, a cousin of mine (a few times removed) wrote a book on the Cornes family. 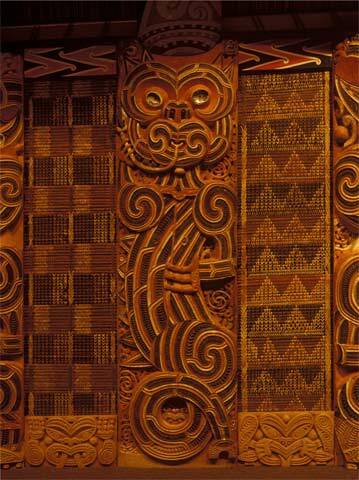 Only two lines came to New Zealand in the 1860s, and both settled in and around Thames. This book is about he descendants of Clement Cornes and Barbara Moran (variant spelling). The book is reduced and available on trade me. Clement was a mine manager and owner all over the Coromandel Peninsula - in his own words he 'won a fortune and lost a fortune' many times over. Such was the life of anyone with gold fever! 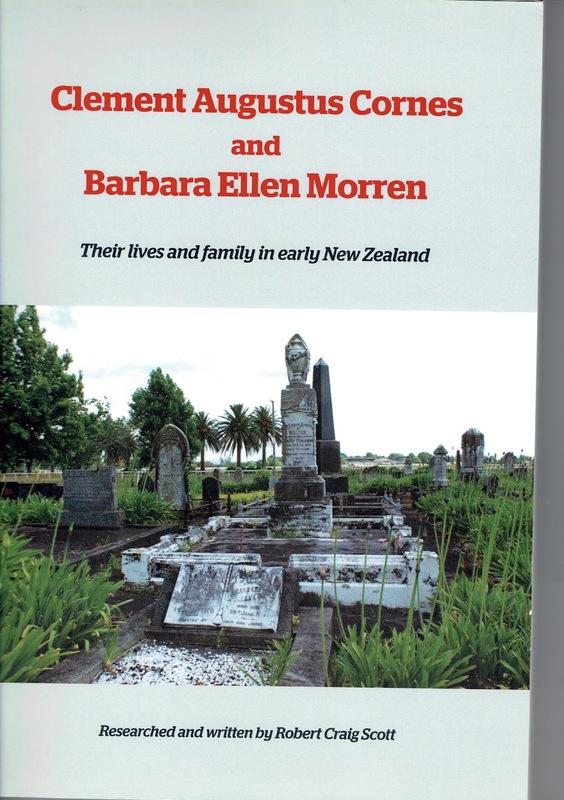 Barbara was a true pioneer, having arrived as a young child, when her father arrived in Auckland as 'Fencible'. So if you are a descendant of Clement and Barbara Cornes, shout out to Bob and get a copy of his book before they run out. PS. Interestingly the School of Mines has a booklet for sale on the minerals of the Tui Mine, it was Clement Cornes that discovered and started the mine. 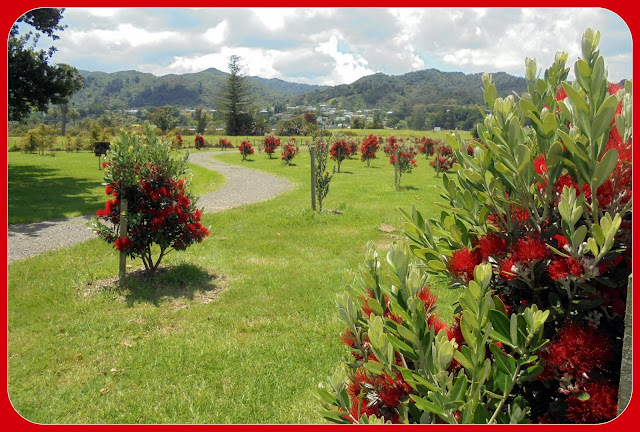 A special banquet was held in his honour at Te Aroha in 1888. 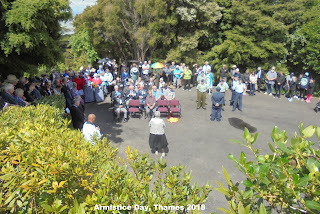 Thames had been planning their peace celebrations all week, despite the worsening situation of influenza in the town and surrounds. The schools had closed and even the Post Office, while churches held very short services. On 12 November, the paper reported that celebrations were being arranged, once it was definite the the peace agreement had been signed. Then on the front page of the late edition an overlay caption appeared (see below) The Armistice with Germany had been signed. The newspaper the following day (13 November) reported the towns dilemma, while flags were being flow all around the town, many had been lowered to half mast, on account of all the deaths that occurring in the district from the influenza outbreak. 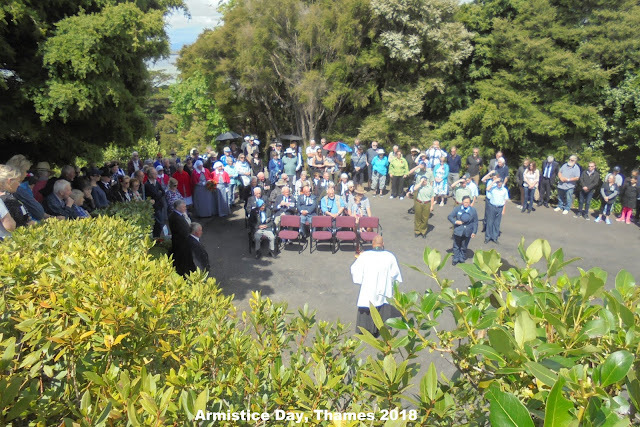 Today the town has remembered the 100th Anniversary of Armistice, with a service up on the Waiotahi Hill beneath the Thames Peace Memorial. 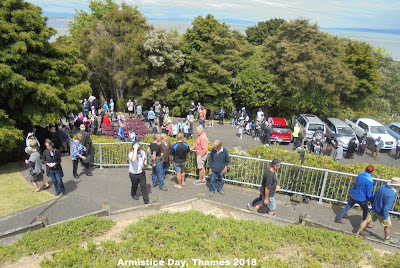 Shuttle van and cars ferried people to the event, while others were like mountain goats climbing the steps from Upper Albert Street. 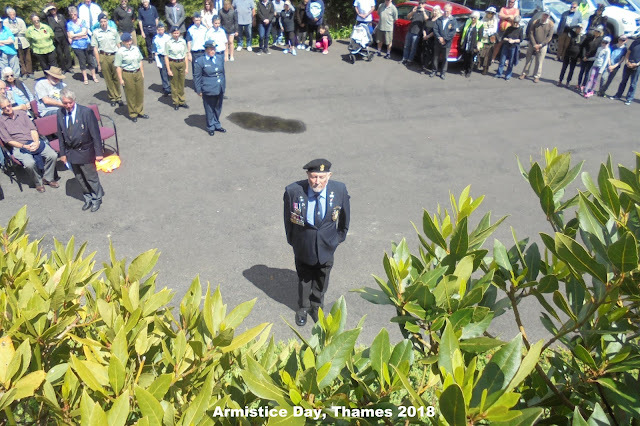 The service was co-ordinated by the Thames RSA, opening prayers from Rev Brendon Wilkinson of the St George's Church, Thames. Followed by short speeches from Scott Simpson MP and Sally Christie TCDC Councillor. All spoke of the effects of war for those who came home, as well as the numbers lost overseas. 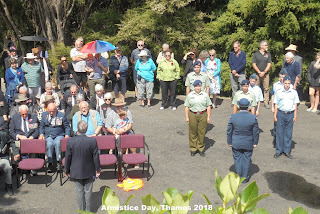 The ATC stood guard, at the car park and surrounding the Peace Memorial. Scott Simpson (left) and Sally Christie (right) addressing the crowd. The TCDC wreath was laid by Sally and friends. 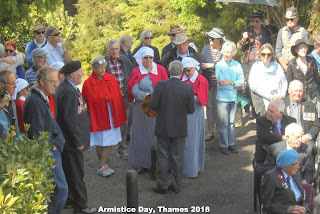 Thames Nurses laid a wreath (left) and Scott Simpson MP (right). 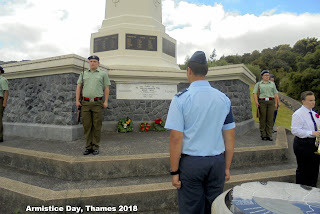 A wreath was laid by the RSA followed by a prayer. 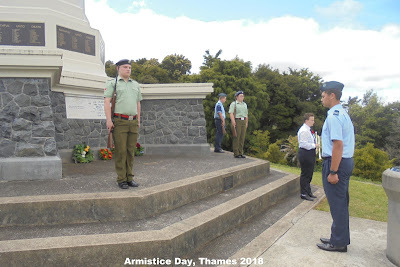 The last Post was played and the wreaths were then taken by the ATC Guards to be laid at the base of the cenotaph. 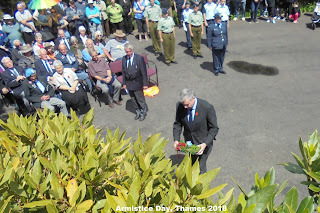 The wreaths presented by the RSA, Thames Nurses, Scott Simpson MP and the TCDC. 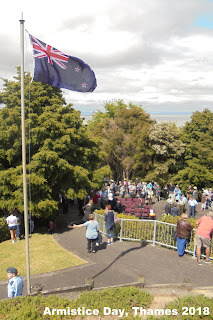 Those gathered then climbed the path to the Peace Memorial. 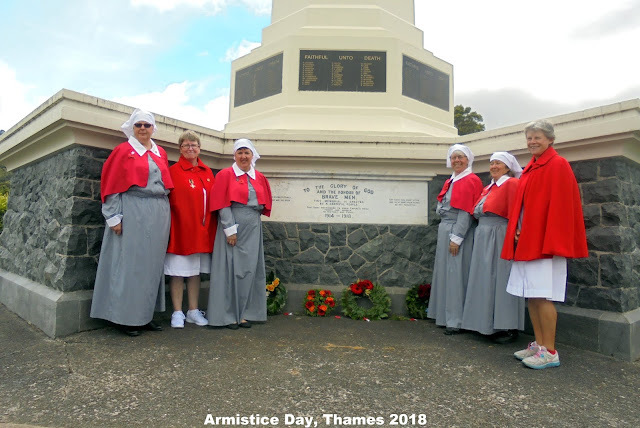 Thames Nurses gathered at the Memorial to remember the nurses who served overseas in the Great War. Four dressed in the commemorative WWI uniform and two in the uniform from the 1980s. RAE Thomas Handley; 12/3453; 2nd Lieutenant NZRB KIA, and buried at Le Quesnoy Communal Cemetery Extension, Nord, France and HUNTER John Joseph; 49153; Private 2nd Batt WIR, KIA, and buried at Le Quesnoy Communal Cemetery Extension, Nord, France. Reading an article by Jude Dobson in the New Zealand Herald, Sunday 11 November 2018, the name of Bernard Ayling is recorded. 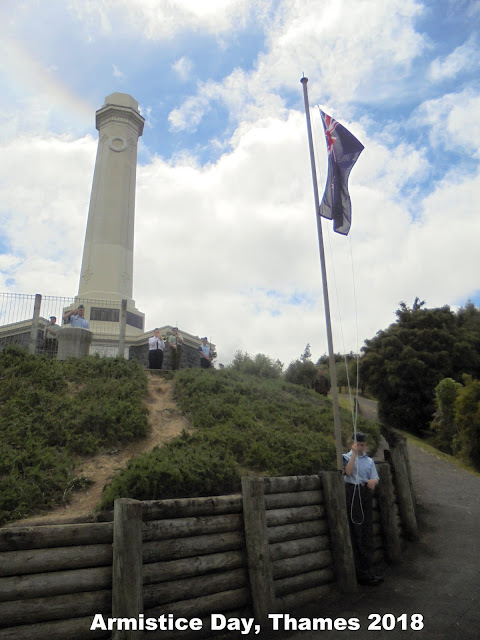 The article discusses the Dolores Cross Project where our soldiers overseas are taken a little bit of New Zealand. 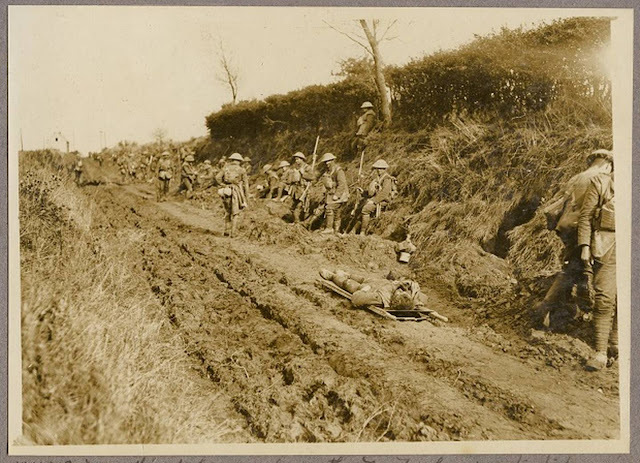 Dobson recalled placing one for NZ soldier Bernard Ayling, "Another, Bernard Ayling, I knew of as the wounded man on the stretcher in an archive photo - their concern wondering if he would survive. Alas, he did not. 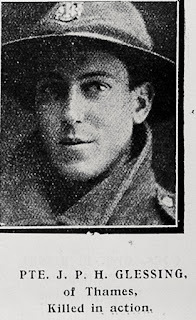 Bernard Ayling was the son of Stanley and Minnie Ayling of Rolleston Street Thames. 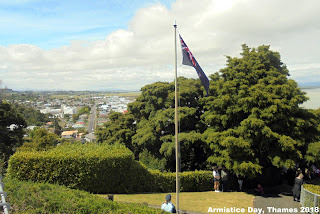 Stan worked in the Post Office and Bernard was a clerk in Auckland on enlistment. 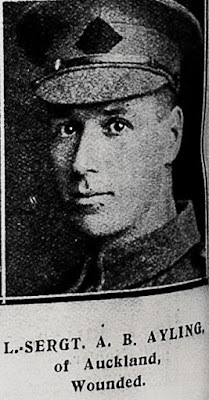 Bernard's brother Herbert had died in 1915. 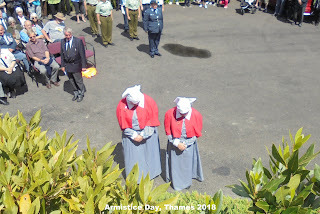 The full article is online : Armistice day: Lest We Forget. 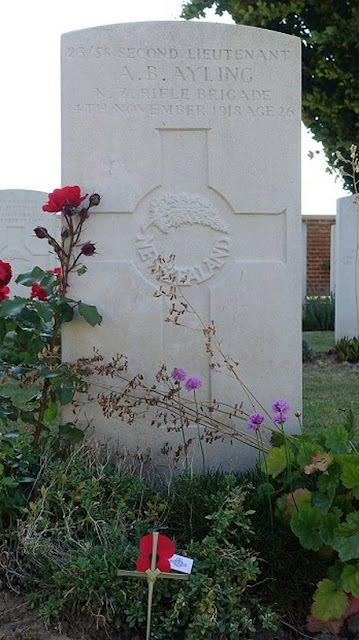 Bernard Ayling's grave in Romeries Communal Cemetery Extenstion, France. While to the town tried to cope with the flu pandemic, the Thames Star Newspaper was still full of news of the Great War end. 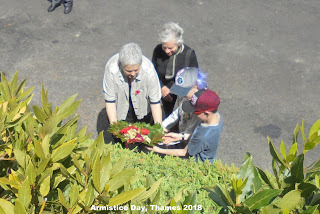 Thamesites celebrated the end of the wharf a few days early, with bells tolling and horns tooting, only to be told that confirmation of the end of the war had not yet been officially received! 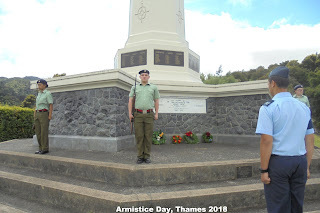 The towns folk where reminded that they should wait until official news was received - there would be three tolls at intervals of the Shortland and Pahau Street Firebells. People should then quickly proceed to the Shortland end of Pollen Street and march behind the bands to the Park. The proclamation would then be read! UPDATE ON THE PROCLAMATION in the next post. 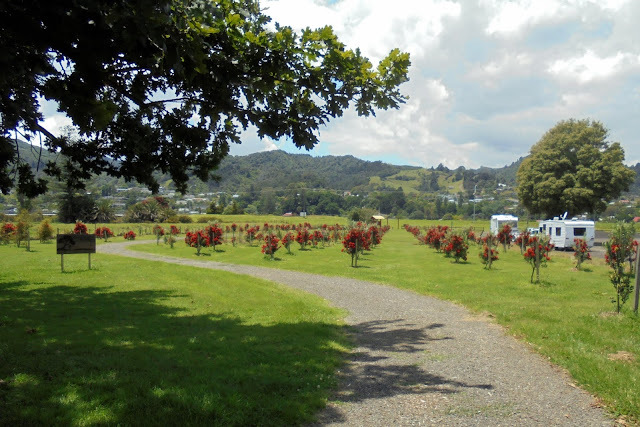 Driving past the WW100 Commemorative Forest it was pleasing to see the progress being made to the forest located at Rhodes Park, south of the Kauaeranga River. A boardwalk crossing has been made from the car park over the drain to the cycle/walkway. An entrance is being constructed and a covered kiosk that will have information on the forest and the war. Well done TCDC and all concerned with the project.